I first heard about the SM Prestige card while reading about the SM Advantage card online. I even called the latter a disadvantage card in the past. :D But seeing the number of points I’ve earned over the years through several renewed cards, it may indeed be advantageous after all, considering the fact that I can redeem those points and I’ll still be shopping through SM anyway with or without the card. 2. Discounts and freebies from various establishments as well as special deals exclusively available for Prestige card holders. You will be notified via email if there are any. For the latter three benefits, you can easily spot the lanes through the SM Prestige card logo. I'm not sure if this is official but I got an item replace/exchange even without the receipt by simply using the Prestige Card as reference. The SM Store where I got the item from assisted me and was able to trace the purchase using my card's electronic transaction at their store about 3 days beforehand. But this may not always work with all stores and other policies for returns/exchanges will still be enforced, i.e. no-no for underwear and so on. To become a Prestige Card holder, you should first be a SMAC holder and have made a purchase of at least 300,000 within 2 years. Prestige status is automatically renewed with a minimum spending on 150,000 within 2 years. Spending should be at SM stores and its affiliates. If you feel like you are already qualified for Prestige, you can contact SMAC through their hotline or through a customer service counter at any SM branch. It is automatically detected by their system though so you don’t necessarily have to do anything. You will be notified through text, email or a phone call. In my case, I received an SMS notification and was instructed to show the text to a customer service attendant at any SM mall along with my Advantage card and a valid ID. The Prestige card was issued after a few minutes but I get to keep the other card. I just actually renewed it a few weeks earlier and can still use till it expires in 2016. What shocked me is that I’ve spent that much already? It doesn’t even include other malls and stores where we shop and dine as well. I wouldn’t call it unnecessary spending though because it consists of groceries at home and gadgets or gizmos that are needed. We moved last summer and needed stuff so that’s one factor. But how I wish I could have saved more and spent less instead. Here's an update to this post about two years after (November 2016). Renewal had never been easy. I just presented my card to an SM Department Store Customer Service counter (any branch works for this purpose) and waited for verification. It took about a few minutes including printing my new card. While renewal is automatic with a minimum spend of 150,000 within two years, you still need to present the card for replacement at any SM customer service counter because there is an expiry date on those cards. I just had the card renewed again (November 2018). You can move points from the older SM Advantage card to a new Prestige card or even between the same type of cards, if you have multiple cards. There is an option to do that through the SMAC website. Just go to My Transactions and then Points Transfer to follow the process. I am not sure if this is possible for family members who wants to pool their points together but do contact the SMAC hotline to check. Both the My SMAC mobile phone app and the website online version allows you to view your card details including points earned, transactions and more. The website is more detailed though. 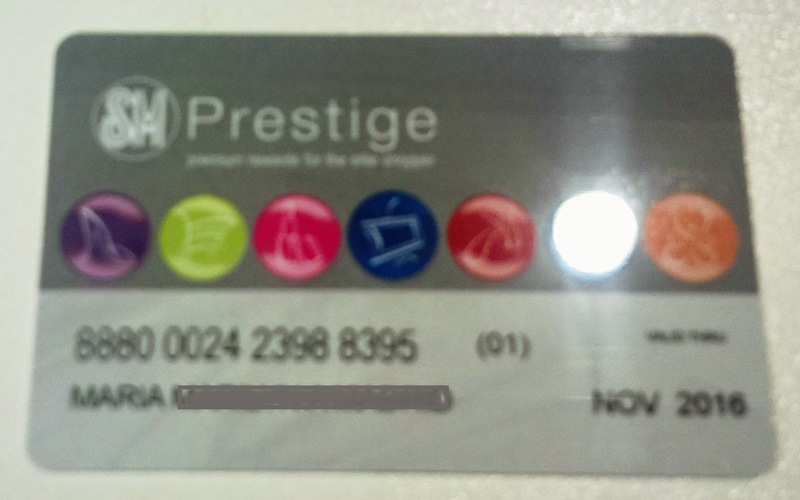 If you own a Prestige card, you can track how many points are needed in order to qualify for renewal. To use this feature, you just need to register your email address and SMAC card. These are the numbers listed as of this update (Oct. 8, 2018). From the list of phone numbers available, I was able to use the local landline hotline. The recording said they are open from 10AM to 11PM. The agent who assisted me over the phone was very helpful. does sm prestige earn points? Yes it does; just like the original SM Advantage Card. 1) The Courtesy Lanes at the SM Supermarkets/Hypermarkets: They are of great convenience, especially during peak seasons as you don't get subjected to massive queues. If there are lines, however, you get to sit in the provided chairs apart from the Senior Citizen's lane. 2) The Preview sales at The SM Store and a few affiliates: Only those The SM Store branches with Prestige lounges in them have these sale events which happens on Thursdays before the 3-day sale starts. The items are already on discount plus an additional 10% markdown which is not qualified for regular SMAC members. What this means is that you don't have to be at the store between 9am (or earlier) to 12 noon on Fridays for the regular SMAC sale. I believe this promo is extended to the other SM affiliates such as ACE Hardware, Uniqlo, Crate and Barrel, and SM Appliance Center (only 5% for Appliance). 3) Free delivery for The SM Store, Our Home, and SM Appliance Center: Every Php50,000 purchase entitles you to free delivery within 10km radius of the store. *Bonus hack - If you live far enough from the Appliance Center, you can ask them to waive the fee for you (all it takes are PR skills). 4) The Prestige Lounge: Ultimately, this has got to be the single huge perk of being a member. The lounges look so gorgeous, not to mention, the staff are well-trained and very courteous. You get to have endless supply of coffee and water for you and 2 guests. *Bonus hack - whenever you need to bond with your friends over a cup of coffee but worry about spending cash on expensive ones, you can take them there and stay for hours. Thank you for sharing a very detailed comment. What I enjoy the most is the Preview sales as you have mentioned. There are also sales events that are exclusive for Prestige members. What are the contact information to check if we qualify to upgrade to Prestige? 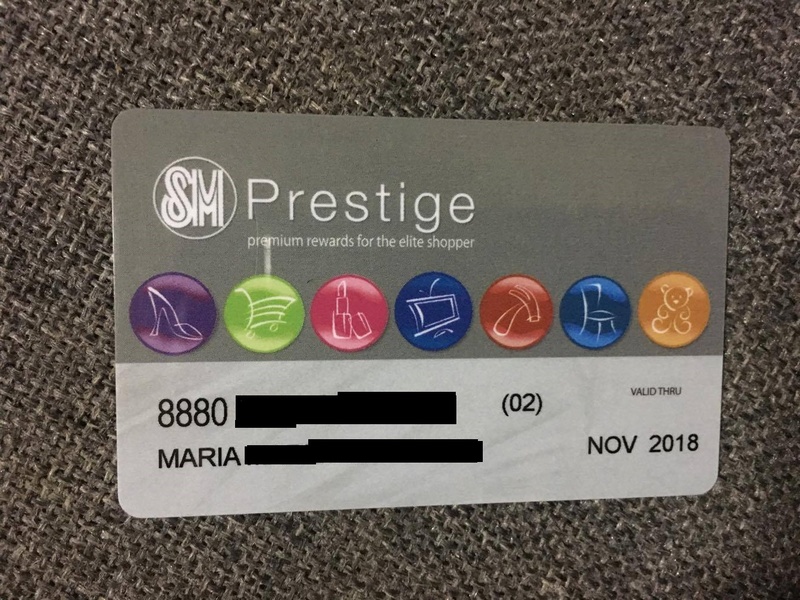 "To know if you have already qualified for Prestige membership, please inquire at the Customer Service Counter of any branch of The SM Store, or call the SM Advantage Hotline: 833-8888 (for Metro Manila) or 1-800-10-833-8888(for areas outside Metro Manila)." How about parking fee? I hope having a prestige card would entitle me to a free parking space considering that I do my groceriea everyday for my business. No. Sadly, parking fee in not included. Pwede po ba hiramin yung card nung may ari nung card? Mother ko po may ari. whats the diff of emerald and prestige? You mean the BDO Rewards card? Based on this page from the BDO website, https://www.bdo.com.ph/bdo-rewards/perks-and-privileges, the perks are almost the same as the SM Advantage card (including Prestige). Some of the perks listed above (for SM Prestige) are not available for the BDO Emerald Rewards card though. Does becoming Prestige holder depends on total amount you spent? How about for SMAC pts, would you know how many pts to become prestige holder? Is it only based on total amount spent,how about if pts earned, how many SMAC pts to become Prestige holder? Thanks! No points requirement for Prestige, just total amount spent in SM stores. The points are equal to peso spend. Just multiply your total points to the peso amount of a point. "Your SM Prestige membership is automatically renewed if you maintain the minimum required spending of P150,000 across all SM Retail establishments within two years." Yan nakalagay sa website ng SMAC pero kelangan mo pa rin pumunta sa SM customer service counters para palitan yung mismong card kasi may expiry date. Hi! By far, I've got 2,704 points in my SMAC. How many points do I need to avail the prestige card? I think it's not based on points but based on how accumulated money spent? In my case, it was offered freely through email & SMS which I registered for the original SMAC. will i get a notification if I'm qualified for a renewal? If I didn't get any notification does that mean I'll be reverted back to SMAC? How about spending in Shell for gas? I use my regular smac there for points. Is that included within the required 300,000 to qualify for the sm prestige card? Is spending in Shell gas stations included in the 300,000 requirement to apply for the sm prestige card? Yes 200 pesoS is equal to one point anyway . Shell gas stations and sm are affiliates so it's the same . No Shell station is not included in the 300k spent requirements to qualify as prestige only purchases at SM Dept Store, SM hypermarket/supermarket and savemore is the one included based on our experience renewing our SMAC. 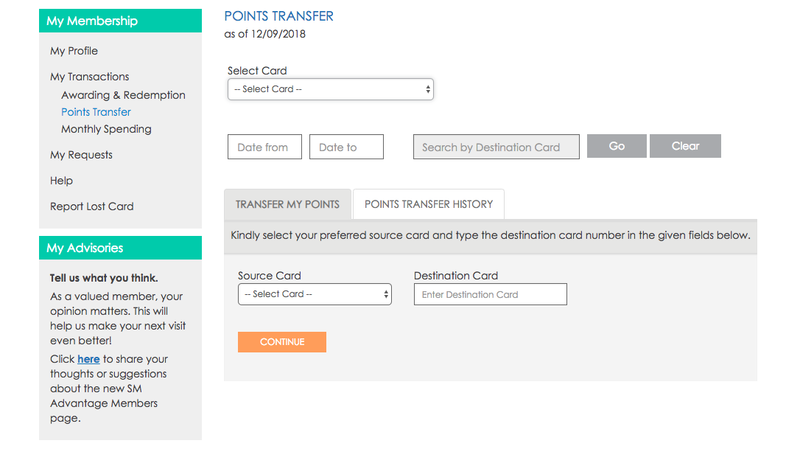 How do I transfer my points from my smac to ny prestige card? Hello! I've added a section to answer your question. But to sum it up, simply contact the SMAC hotline for the process. When your card gets upgraded, the SM Customer Service personnel at the mall can complete the process for you. But you can also do the same from your account online. I've added that process in the post above. Can i borrow the sm prestige card of my father for the parking lot? I think you can. It's not like using a credit/debit card (payment methods) so maybe that's why they don't really check the card's details when swiping the SMAC.